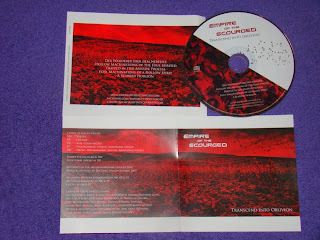 One day I was contacted by someone from completely unknown band called Empire of the Scourged if I would like to check and maybe also review this band’s newest recording, which was an EP titled “Transcend into Oblivion”. Well, I said yes, why not and so soon I got this material on CD. And as always, also here I must say that it is great to find a new band, obviously if only their music is cool… Luckily, I can say that the music of Empire of the Scourged is interesting and worth checking out. At the same time I need to add that my first impression was not the best, but that’s because I have listened to this CD on not the best equipment, so I was losing a lot of the aggression and all what is going on this album. Finally though when I have started to listen to “Transcend into Oblivion” at home, on my normal stereo, my impression was way, way better. But this EP is not an easy material and I suppose that Empire of the Scourged may get as many followers and enemies. Why? Well, the reason is obvious. While the basis of “Transcend into Oblivion” is death metal, Empire of the Scourged has increased their sound with lots of industrial sounds or cosmic sounding keyboards, so their music has very mechanical sound and kind of inhuman feeling, in some way… For some it will sound then just too plastic and sterile, for some it will be not brutal enough and some other will even call it disco / techno death metal. So this is why I think that “Transcend into Oblivion” will bring many various opinions and it’s also why I think this material is not an easy listen. But saying that I must also mention that I’ve listened to this EP with great interest and actually found it very enjoyable. You know, Empire of the Scourged tries to come up with something different and original and that’s good. And the fact that they use a lot of keyboards, drum machine and even have some female vocals in few places doesn’t mean that the music is not aggressive and has no atmosphere… Here the atmosphere is not about the horror or gore, but more like cosmic sci-fi kind of thing. And it is cool. I like that diversity in this music and how they blend these so different styles. Interestingly I can spot that Empire of the Scourged has also some black metal influences here and there, like for example when they blend growling with harsh, more black metal kind of screaming… But generally this is just great, extreme music. And as such I can recommend you checking out this band, if you’re more open minded kind of maniac. What is this blog for...?